Hello dear fashionables! This week has brought me happiness and it's not even Friday! As a completion of my market & thrift/charity shopping introduction from the weekend here are more items that I wanted to include for the #06 installment of Vanity + Vintage. I hope that you enjoy! Perhaps there's something specific that you've found recently at a vintage shop. Let me know, you may be featured in an upcoming V+V series with me. This is an old mini-briefcase that I bought years ago. I finally took it to an expert and she told me that it was an early 70s piece. I loved it so I included it in the shoot anyway. The other goods: Shoes: Anthropologie, Swallow necklace: Maylee's Jewelry, Belt: thrifted, Beaded necklace: flea market, bag-Thrifted/see above Ann Taylor, Denim-Cheap Monday, Blouse-charity shop. *Update: Deadline for V+V entries are now closed. Madison- that case is Steve McQueen cool, so of course it's in the shots. The whole outfit is fresh- not a whiff of vintage to it to me, I love the mint green belt with the orange/tan leathers. The shoes are pretty chic too. Liking the series. I may have to send you something- would LOVE to be featured by you! xo. I'm also loving this series! This is a very cool look, with a very vintage vibe. The briefcase and bag are fantastic! Love, love, love that suitcase! Very cute look! Nice! I love the woven purse. great outfit! love your top so pretty! LOVEEEE your bag and shoes... stunning!!!! Oh man!!! The belt looked good in your previous post but it rocks the house on you! Love the whole look, super fresh take on 60's and 70's. I love how the belt and the shirt work together- so cute!!!! I LOVEEEEEEEE THIS OUTFIT! The colors, the suitcase, the pants! I'm all about thrift shopping, and you my dear have found some great stuff!!! Thanks Sweet, on both comments! Love ya! I love the contrasting colour of the belt and the red in the top. The little suitcase is a cool find as well. I am ashamed to confess that the only vintage thing I've ever bought is a leather jacket from Gianni Versace collection. But that piece can't be called vintage as it is from the 90', while vintage has to be from the 70' at most. Love your find. Hi thanks Erika! 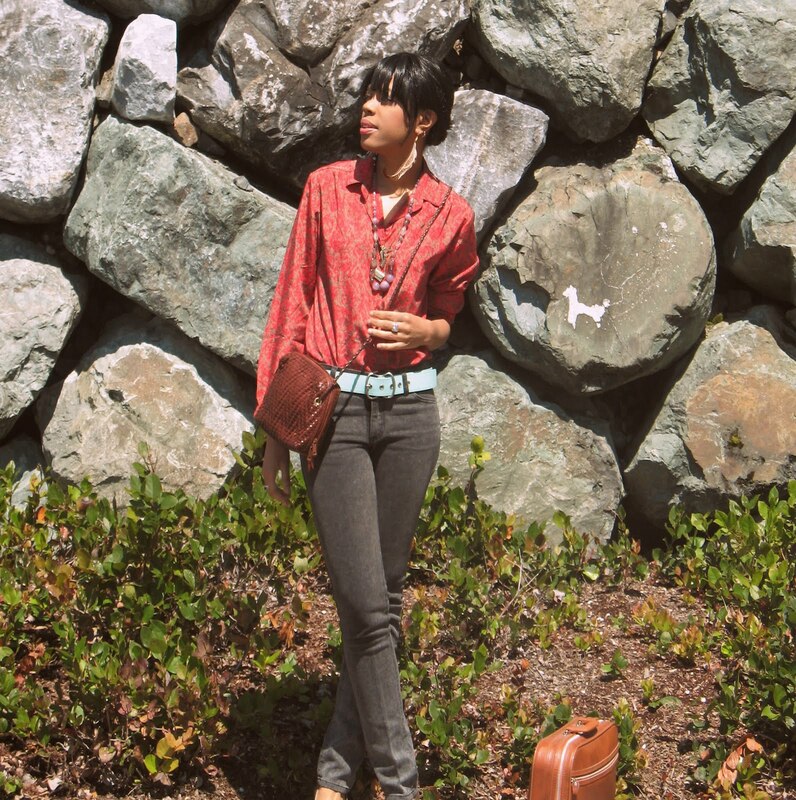 So glad that you were into this vibe, yes most thing here are 70s except the vintage bag. I love it! oh my gosh! That brief-case bag, I want it! I really like your blue belt too. I love all of your accessories, the bags the jewellery - fab! great outfit. love the red top with the gray pants with that white belt. and what great finds. the purse, the shoes, all really lovely! Great location for an outfit shot. Your outfit looks great on you and I love your finds. 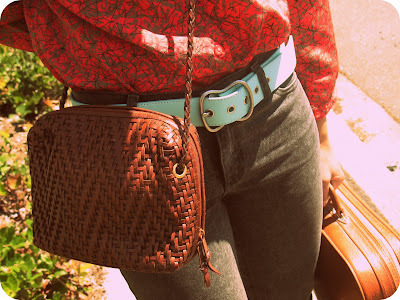 I recently bought a couple of vintage wicker purses and I'd like to find out more about vanity + vintage. I will check out the link. Thanks so much! Firstly, you are so sweet to include me in the Sunshine Award. I'm honoured. So glad that you liked it too, I love finding deals! !